In a large bowl, mix the fruit cocktail, banana, coconut, and apple together. Add in marshmallows and walnuts. Mix to combine. In a separate bowl, mix sugar, vanilla, and sour cream together until sugar is completely dissolved. Pour sugar/sour cream mixture over fruit. Mix well. Serve and enjoy! Add any additional fruits you would like in your salad. Any fruit will work. 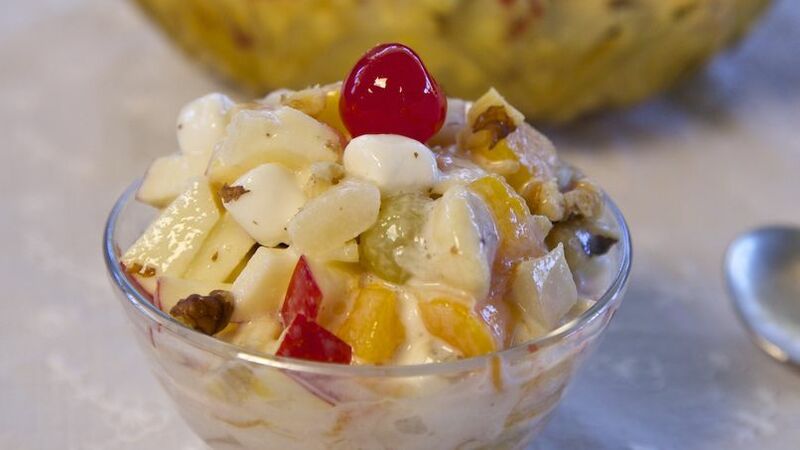 The first time I had ambrosia salad was at a large gathering at someone's house where there was a lot of food and desserts. I spotted the salad for its colorful appearance in the dessert table because it is one; and quite a delicious one I might add! This fruit salad is a classic, old-fashioned dish that lives in a modern world and is making a huge comeback. Delight your guests with a unique dessert they've never tried before!